The Program of the Board of Supervisors of the Seminole Soil and Water Conservation District for 1963. The organization began in 1948 with a goal to assist in agricultural interests. Over the years, the Seminole Soil and Water Conservation District began to also concentrate on the development and management of recreational enterprises. Their interests also entailed inventory and evaluations for land uses and solving issues concerning soil and water resources. The fourteen page program from 1963 discusses the history of the organization and contains information pertaining to the goals of the Seminole Soil Conservation District as well as the major problems they face regarding water control, soil depletion, erosion control, wildlife, land use, livestock, egg production, and recreational and rural land development. Original 14-page typewritten report by the Board of Supervisors of the Seminole Soil and Water Conservation District,1963: Folder SSWCD Statistical and Historical Information, 1948-1977, Seminole Soil and Water Conservation District, Sanford, Florida. 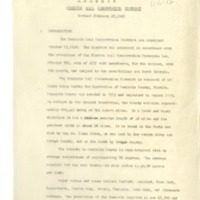 Digital reproduction of original 14-page typewritten report by the Board of Supervisors of the Seminole Soil and Water Conservation District, 1963. Folder SSWCD Statistical and Historical Information, 1948-1977, Seminole Soil and Water Conservation District, Sanford, Florida. Helms, Douglas. "Hugh Hammond Bennett and the Creation of the Soil Conservation Service." Journal of Soil and Water Conservation 65, no. 2, March/April 2010, 37-47. https://www.nrcs.usda.gov/wps/portal/nrcs/detail/national/about/history/?cid=nrcs143_021384. Helms, Douglas. "Eroding the Color Line: The Soil Conservation Service and the Civil Rights Act of 1964." Journal of Soil and Water Conservation 65, no. 2, Spring 1991, 35-53. https://www.nrcs.usda.gov/wps/portal/nrcs/detail/national/home/?cid=nrcs143_021380. Rasmussen, Wayne D. Taking the University To The People: Seventy-five years of Cooperative Extension. Ames: Iowa State University Press, 9189. Shofner, Jerrell H. "Roosevelt's 'Tree Army'." Florida Historical Quarterly 65, no. 4, April 1987, 433-465. https://ucf.digital.flvc.org/islandora/object/ucf%3A25480/datastream/OBJ/view. DeFreese, Duane E. "Florida and the Environment: From 'La Florida' to Global Warming: 2008 Jillian Prescott Memorial Lecture." Florida Historical Quarterly 87, no. 4, Spring 2009, 465-483. https://www.jstor.org/stable/20700248?seq=1#page_scan_tab_contents. Hammond, Ralph. “Program of the Board of Supervisors of the Seminole Soil and Water Conservation District, 1963.” RICHES of Central Florida accessed April 24, 2019, https://richesmi.cah.ucf.edu/omeka/items/show/9271.